I had lunch today at the much praised and reviewed 4 month old casual Italian restaurant Cotogna in Jackson Square, San Francisco. The place is joining the owners Lindsay and Chef Michael Tusk’s already much loved restaurant Quince. All of the stars and esteemed praises are true – the food was really great. The menu reads very local and seasonal – my favorite. Our waiter set a plate of focaccia down to start – that could literally ruin your meal if you don’t have any bread restraints. It was deliciously salty with a bit of heat from the chili. Our Antipasti started off with Fava leaf sformato with grana padano. A sformato is similar to souffle in style and this one was rich and delicate – with the fava flavor shining through. 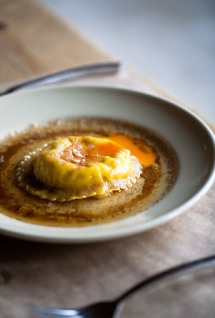 We moved onto our Primi course by sharing the Farm egg ravioli with brown butter (see image above). The perfectly cooked egg yolk slowly oozed out of the tender pasta and into the pool of brown butter – just divine. The Chittarini neri with squid & chili was beautiful and tasted of the sea – minus the salt. Which it needed. We shared our grilled course which was a nicely fennel-cured piece of pork loin spit roasted in their wood burning oven. It sat on top of a bed of perfect spring vegetables. Other things come out of that oven that I’d like to try someday. Here that also included pizza – which seems to be on menu’s everywhere. Including those that it shouldn’t. The dessert menu was classic Italian style with some modern twists. The ricotta and candied kumquat Bomboloni were yummy as was the traditional Affogato. Service was really off today. It wasn’t super busy so we couldn’t figure out what was going on. The hostess seemed to pay the most attention to our table. If the restaurant were closer to my neighborhood – I’d probably pop in often. But, Jackson Square and it’s potential clientele don’t pay much attention to a lady of my size.